A smack* of giant jellyfish appeared in Fire Farm's warehouse early Tuesday afternoon, much to the surprise of local residents. Says one witness, "I've never seen a real jellyfish before. They seem to like it here." The Iowan jellyfish in their "new favorite hang-out" spot. Local jellyfish experts believe the glowing jellies were migrating up the Mississippi River before taking a scenic detour onto the Turkey River, which flows straight through Elkader. Although the exact species is unknown, they bear a striking resemblance to another aquatic Fire Farm creature, affectionately named Project 2748. 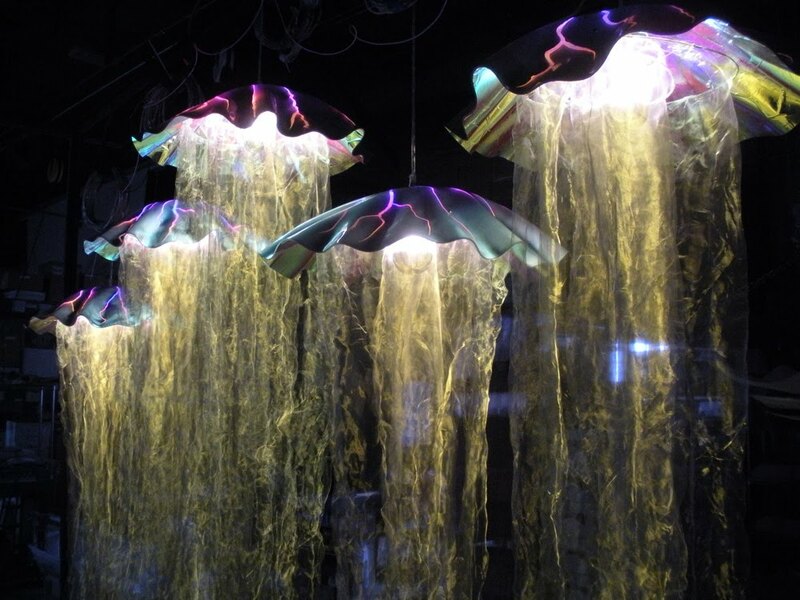 Elkader residents have begun calling the jellyfish "Project 3060," thanks to their close resemblance to the previously discovered Project 2748 (above right). "We think they might be first or second cousins," says someone who knows a bunch about genetics. It is unclear exactly how long they will stay, but the rural community has welcomed the visitors with its usual warm hospitality. "We have a lot to offer tourists, so I'm not surprised they decided to stick around," says one Elkader resident. "We're really hoping they'll spread the word to all of their friends." *Yes, that's what a group of jellyfish is called. Also: bloom or swarm.